Last year we attempted something different with our chickens. We tried a different breed. 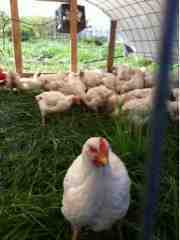 The local grower told us that the birds would grow in about 8 weeks to be 4 pound chickens. We needed 3 pound birds for a chef and 4 pound for our home cooks, so the season of chickens was ordered. Those birds just did not grow. And they were flighty, difficult to catch and did not clear the grass from the bottom of the pen in a 24 hour period. Because they grew so slowly we did not have enough pens to hold all of them. At 10 weeks they still were barely large enough for the chef and certainly not large enough for the home cook. When we called the man who provided the birds to ask what was going wrong, to find what was going wrong, he told us we needed to use chick starter. We had tried an organic chick starter years ago, and when we checked the list of ingredients we were not comfortable with some of the listed items. So we don't use it. And the fact that those birds could barely get to size without it really did not work for us. This year we are running only the variety of birds we have grown for the last 10 years. These birds do well on our farm, in the brooder for a bit until they get feathers and then on the field in mobile pens to full size. The chicken is plump and delicious, and grow in a time frame that works for us. This week we are delivering our first CSA chickens and today we will have them at the teeny tiny market in New Cumberland, and on Thursday in Hershey. 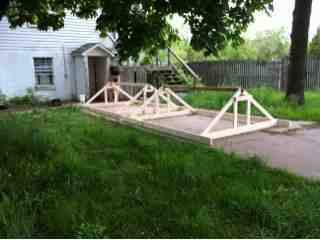 Homer is finishing a couple of new pens, replacements for chicken pens we moved onto the farm in 2009. This design is easier to move, the birds are really protected from direct sun and rain while still getting plenty of sunshine. Full days here. Everything is happening, and we are having fun.